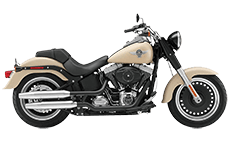 A mysterious appearance and a rumbling engine, the Harley Davidson Softail Fat Boy Lo is a true modern classic. With enough curves to please any rider, finding the right set of saddlebags can sometimes pose a challenge. But Viking Bags, an industry leader of bike luggage, has a team of experienced engineers who design and test their products in the field, and they know bikes better than anyone else. That's why this collection of Fat Boy Lo saddlebags offers riders such a vastly unique array of choices, from mild to wild. Whether you're in search for more studded gear or something a bit tamer, we've got you covered.